While many enterprises are waking up to the volatility of depending on tourism for business, one entrepreneurial couple dared to place their future in the hands of the local community instead. Nyamnyam uses food as a catalyst to open conversation among locals and is now flourishing as a multifaceted cultural organization with gastronomy and human connection at its core. Back in 2012, Ariadna Rodríguez, her partner Iñaki Alvarez and their baby daughter moved from Gràcia to Poblenou. Aware of the lack of opportunities for creative professionals, they decided to try something new. “We wrote down a list of our transferrable skills and agreed on cooking almost immediately,” Ariadna tells me. Out of their modest studio and living space, christened Espai Nyamnyam, the entrepreneurial couple debuted a weekly lunch club called Al buit (Into the void). After crafting a menu based on “zero-preservative, zero-kilometer” principles, they uploaded images – slithers of blushing steak, a mushroom fideuá, beetroot soup or aromatic salmon – and attendees chose two dishes at the crisis-busting cost of 7.50 euros. The concept was an immediate success. “We soon realized that food was just an excuse to open dialogue with people around us,” Ariadna tells me. “Breaking bread is a democratizing element, a conversation starter.” That’s when Ariadna and Iñaki decided to harness their creative backgrounds in visual arts, performance and music, by transforming Espai Nyamnyam into a cultural center that went beyond sociable lunches. 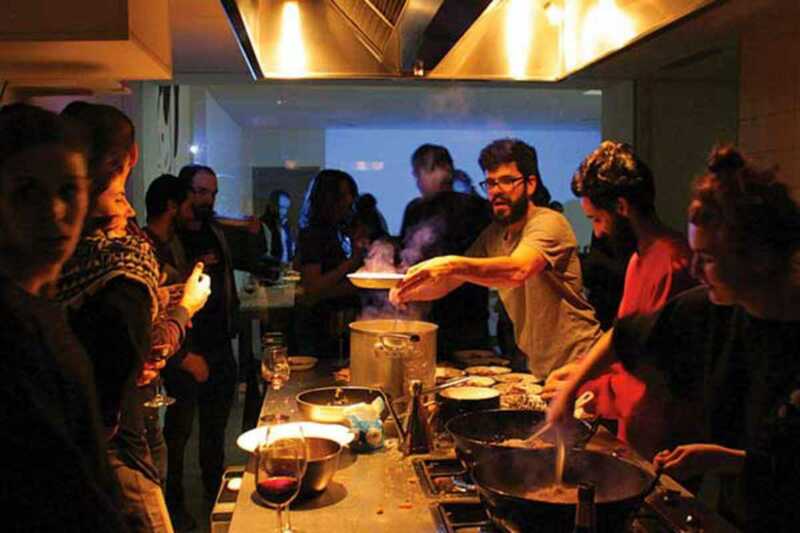 Today, the couple host a gamut of culinary and artistic workshops. Artists use Al buit lunches as a platform to share their creations, tailoring the structure of Nyamnyam’s leitmotif “Todo lo que me gusta es ilegal, inmoral o engorda” (“Everything I like is illegal, immoral or fattening”) to their work. Artists use Espai Nyamnyam as their working studio and they also cohabit the space for a month, immersing the couple in each artist’s creative vision. Nyamnyam’s other projects – workshops for both kids and adults, fanzines and cooking classes – all also offer new perspectives on food. It’s Wednesday and the kitchen island is marooned in a forest of leafy greens, beans and brassicas. Twenty kilometers away, Aurora del Camp delivers eighty kilos of organic produce to Nyamnyam every week, enough to feed the project’s growing appetite while providing an abundant supply of vegetables to the local community. A stream of friends, neighbors and socios trickles through to collect crates of muddy vegetables. Nyamnyam aligns itself with the seasons in a way you’d miss by going to a supermarket: the menu is crafted around whatever’s been uprooted at the farm. One week, Aurora harvested a glut of basil, leading to several new pesto recipes: “green” risotto, mussels with pesto vinaigrette and calamari with pesto mayo. “It seemed logical to record the different dishes we were creating each season, so we made Green Day, one of our first fanzines.” Friends took photographs and they worked in collaboration with a writer and graphic designer before printing the booklet nearby. Because food is intrinsic to our cultural identity and health, we should begin learning about it from an early age, Ariadna tells me, watching her daughter peel apart a plump green bean from the kitchen worktop. “It’s really important to create an exciting and digestible format for children to learn about food.” As part of their Everything I like… series, resident artist Aimar Pérez Galí explored micro- and macro-scales through the phenomena of fermentation and its associated organisms. He later repackaged the idea into Galactic Nigiri, a kids workshop which transformed fluffy rice, fish and algae into stars, planets and satellites of the solar system through interstellar fancy-dress and hand-crafted, cosmic sushi. Needless to say, it was a (g)astronomical hit! Ariadna and Iñaki create fuss-free cuisine to refresh our ideas of provenance, and their messy, playful workshops help us to fortify our relationships with food and each other. For most of us in the city, our food is the main thread that ties us to the natural world. Doesn’t it make sense to spend more time thinking about it?